Recent earthquakes show that the strength and displacement-based methods in many seismic design codes are not as reliable as the energy-based methods in seismic design and evaluation of structures. The determination of earthquake energy input to structures is the main concern for the energy-based structural design methods. The seismic energy input to structures mainly depends on the strong ground acceleration and the velocity time history of the structures. Current studies about the seismic energy input show that the bases of researches are established almost entirely for the single-degree-of-freedom (SDOF) systems. This study investigates the variation of earthquake input energy of SDOF systems which have different period and damping ratio values. Five real earthquake records are selected to perform nonlinear time history analyses. SDOF systems are assumed to be located on the same type of soil profile according to the shear wave velocity values of the first thirty meters of the soil. Bilinear hysteretic model is used and constant ductility is considered. Three different damping ratios as three, five and ten per cent are taken. Energy time-histories of bilinear SDOF systems are obtained graphically for selected earthquakes and for different damping ratios. The main objective of the research is to see to what extent the energy input has changed for different damping ratio values. 1. Khashaee P, Mohraz B, Sadek F, Lew HS and Gross JL. Distribution of earthquake input energy in structures. Gaithersburg: Building and Fire Research Laboratory, National Institute of Standards and Technology (NISTIR 6903); 2003. 2. Housner G. Limit design of structures to resist earthquakes, Proceedings of The First World Conference on Earthquake Engineering, Oakland, CA.,1956. 3. Zahrah TF and Hall WJ. Earthquake energy absorption in SDOF structures. Journal of Structural Engineering, 1984;110(8):1757–1772. 4. Akiyama H. Earthquake-resistant limit-state design for buildings. Japan: The University of Tokyo Press; 1985. 5. Kuwamura H and Galambos TV. Earthquake load for structural reliability. Journal of Structural Engineering, 1989;115(6):1446-1462. 6. Fajfar P, Vidic T and Fischinger M. Seismic design in medium and long period structures. Earthquake Engineering & Structural Dynamics, 1989;18(8):1133–1144. 7. Uang C-M and Bertero VV. Evaluation of seismic energy in structures. Earthquake Engineering & Structural Dynamics, 1990;19(1):77–90. 8. Manfredi G. Evaluation of seismic energy demand. Earthquake Engineering & Structural Dynamics, 2001;30(4):485–499. 9. Leelataviwat S and Goel SC. Energy-based seismic design of structures using yield mechanism and target drift. Journal of Structural Engineering, 2002;128(8):1046– 1054. 10. Akbas B and Shen J. Earthquake resistant design and energy concepts. Technical Journal of Turkish Chamber of Civil Engineers, 2003;14(2):2877–2901. 11. Benavent-Climent A, López-Almansa F and Bravo-Gonzalez DA. Design energy input spectra for moderate-to-high seismicity regions based on Colombian earthquakes. Soil Dynamics and Earthquake Engineering, 2010;30(11):1129–1148. 12. López-Almansa F, Yazgan AU and Benavent-Climent A. Design energy input spectra for high seismicity regions based on Turkish registers. Bulletin of Earthquake Engineering, 2013;11(4):885–912. 13. Mezgebo MG. Estimation of earthquake input energy, hysteretic energy and its distribution in MDOF structures, PhD Dissertation, Syracuse University, New York, 2015. 14. Dindar AA, Yalcin C, Yuksel E, Ozkaynak H and Buyukozturk O. Development of earthquake energy demand spectra. Earthquake Spectra, 2015;31(3):1667–1689. 15. Chopra AK. Dynamics of Structures Theory and Applications to Earthquake Engineering. 2nd edition. New Jersey: Prentice Hall, Upper Saddle River; 2001. 16. Fajfar P and Vidic T. Consistent inelastic design spectra: hysteretic and input energy. Earthquake Engineering & Structural Dynamics, 1994;23(5):523–537. 17. PEER: Pacific Earthquake Engineering Research Center Strong Ground Motion Database. [Document on the Internet]. 2017 [cited 2017 February 15]. Available from: http://ngawest2.berkeley.edu/. 18. Turkish Seismic Design Code. Ministry of Public Works and Settlement. 2007. 19. PRISM: Software for Earthquake Engineering. [Document on the Internet]. 2011 [cited 2017 February 20]. Available from: http://sem.inha.ac.kr/prism/. ISNAD Merter, Onur , Uçar, Taner . "AN INVESTIGATION OF DAMPING RATIO EFFECT ON EARTHQUAKE ENERGY INPUT". 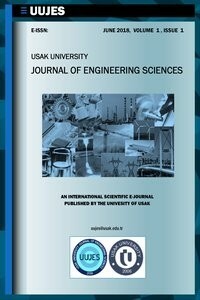 Usak University Journal of Engineering Sciences 1 / 1 (June 2018): 8-18.